Garden design ideas for a low maintenance garden including water features like a fountain, stream, waterfalls, and ponds, garden furniture, deck, path, and play area. 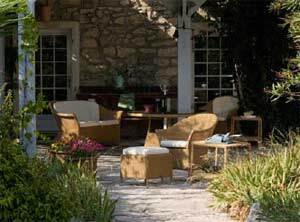 Garden design pictures, garden design Ideas and landscape design inspiration. This project is centered around garden design ideas including garden design pictures of each stage of the transformation for a low maintenance garden which incorporates, decking, a summer house for shade, a bark play area with rope swing, garden path, water features including a stream, a waterfall over a ‘cave’ and a fountain. A lot to ask of an area only 12 metres by 8 metres! This garden had three main briefs; to be low maintenance, hold the interest of a five year old, and add value to the house. Primarily it had to feel very comfortable and relaxing to be in. We must, at this point, offer a big thank you to our garden designer Adrian Marshall, who took on the challenge and gave the team a design to work to. Make sure that when you plan a garden makeover, or any other home improvement project, that you make sure give yourself an achievable target to you allow enough time to complete the work. This project was undertaken over the course of several weeks. Parts of it are very involved indeed. We have given an overview of each procedure and construction element. 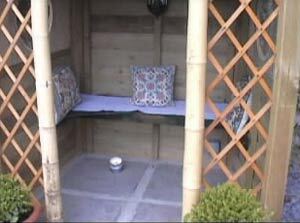 Do you want Seating areas like a Patio, Terrace or Decking? Do you want cooking facilities such as a barbeque or a firepit? Do you like to lie in the sun or relax in the shade? Will there be children using the area? Do you need to accommodate pets? 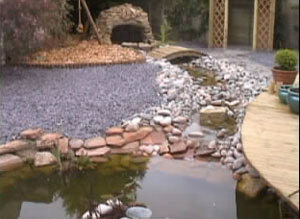 Would you like to include Water Features? Do you want Flower Beds, Fruit and Vegetable Garden, Raised Beds or Pots and Containers? 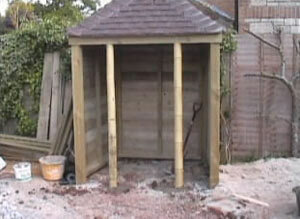 Do you need Garden Storage for Toys, Bikes, Garden Equipment etc? 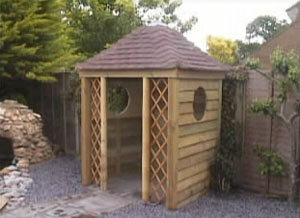 Will you put up a Shed, Summer House or Tree house? Do you want garden furniture that allows you to lie in the sun, entertain or just sit comfortably? Do you need a form of heating, gas fired heater, Firepit or Chiminea? 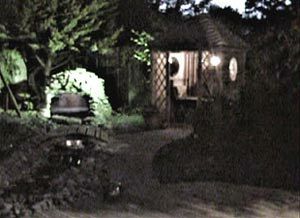 Do you want Garden Lighting for great visual effects, and to use the garden for entertaining? You also need to consider existing plants and trees and whether you will keep them, remove them or transplant them. Another important element is to work out where the sun is at different times of the day, and how this will affect your garden design. Finally make sure you keep yourself safe by making sure you have the correct safety equipment, that you use tools properly and you take care when using electrical items in the garden. Check out RoSPA’s Guidelines (Royal Society for The Prevention of Accidents) on their website under Garden Checklist. For our Garden Makeover we waited a full growing season after moving in before starting on the garden so we could see what plants came up and how the sun affected the garden, before we decided on our best garden design. Once we had our plan, the first step was to get some help. 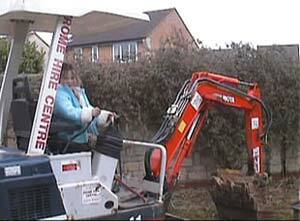 For those who are concerned; this little lady was not really the digger driver………..She was the BOSS! OK, down to business: The first step involving any project with "running water" is to make sure you have got the levels correct. This will help you to ensure that raised beds are level, patio and decking areas are flat and slightly sloping away from the house and that ponds and water features look right when they are filled with water. Water will not run uphill. The easiest way to check the levels is to get an easy to use site level, which can be hired from your local tool hire shop. Generally you will get a basic set of instructions when you hire it. You will get a staff and a tripod when you hire the level. 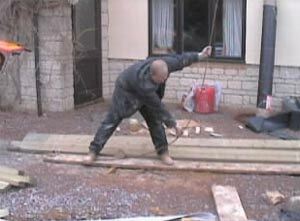 Unless you are a pro, the staff is difficult to master so you can use a batten or even a broom handle. 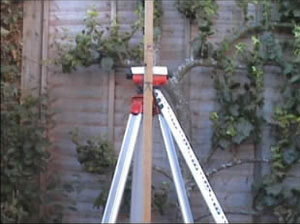 We also have a video which shows you how to use a laser level which makes the job even easier. Do not guess or skimp on this process, the preparation of the site is absolutely key to getting a great finish. You will only want to do the job once so get it right the first time. The next step for us was to import some scalping’s because the weather was awful and the mud was being trampled everywhere. It’s hard work getting them in but makes life so much easier when they are laid. 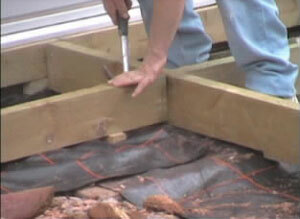 They give a solid bed for laying decking etc and they are permeable so water can seep down into the soil below. We hired a mini digger so that we would be able to dig out the stream and pond, and to be able to move earth around relatively easily when it came to getting the correct levels for each area of the garden. When you hire a large piece of equipment like this you will be given training on how to use it if you are going to do it yourself, otherwise you can employ a contractor, or even hire someone who specialises in offering a mini digger service. We had worked out our levels first, and raised the ground level at the far end of the garden, from which we were going to start the stream, so that it would flow downhill. We devised a series of small waterfalls, like rapids to make the water pool and trickle as it ran down the stream to get a more natural effect. We used the digger to excavate the holding pond, stream and main pond. 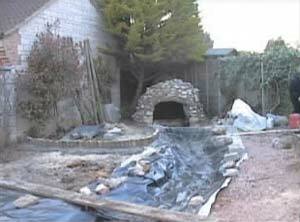 These were then lined with sand to protect the pond liner. 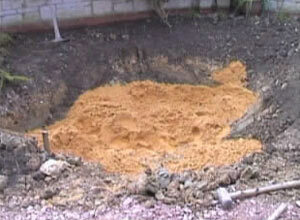 The sand is a precautionary measure against stones puncturing the pond liner. We also used pond liner underlay, but the sand is an extra measure to prolong the life of your pond liner and as mentioned before, we only wanted to do this once! The idea for this was to give a focal point for the stream to run from, and to be our main waterfall feature, as well as being a brilliant den for the children to play in. The holding pond for the stream was dug in half the cave floor and the other half was paved with paving slabs to provide a seat for the children so they can sit and dangle their feet in the pond. As you can see, from the picture, top right, the cave was constructed by bending lengths of steel reinforcing bar (known as rebar) to a curve, and placing them inside a circular foundation that we had concreted approximately 12 inches below the ground level. This formed an ‘igloo’ shape out of the steel rebars. A "dwarf wall" was built around this foundation, so that the top of the wall was at ground level. This wall formed the sides of the holding pond and the front of it was built an inch (25mm) or so lower than the back. This made sure that when the holding pond was full the water, would run over this lower part of the wall only, and down into the stream. 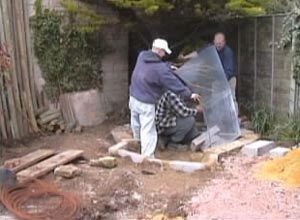 Once the steel was in place, we covered it with some mesh. 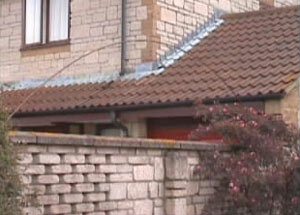 This is called expanded metal lathing (EML for short) and is a galvanised mesh which will not rust. This was "tied" to the steel bars with reinforcing tie wire, or you could even use small cable ties or rose ties. Next the EML was rendered using a waterproof additive in the mix. 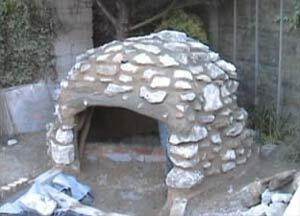 Three coats of render where needed to make sure the cave was waterproof. This was important to ensure it would remain stable over many years. Once water gets into a structure, the cold weather, (of which we get plenty) freezes it. Frozen water expands when it thaws, and this movement inside a structure, no matter how small, produces cracks. These cracks let in more water and the process is repeated in what is known as Freeze/Thaw action. This is why you see a lot of porous bricks that have lost their "face". 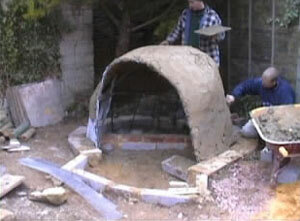 You can find out how to mix mortar and about mortar ratios in another of our projects. You can see here the structure of the holding pond and the mini waterfall that falls out of the holding pond into the stream. 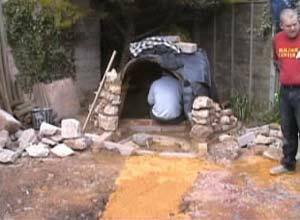 The next step was to lay the stone to form the cave’s outer wall. 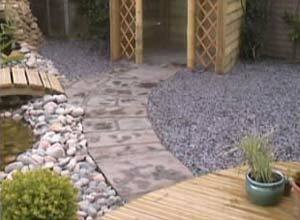 You can use the same process of laying stone to create raised beds, garden walls and stone seating in a garden. 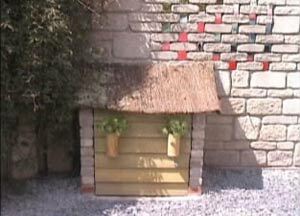 Find out more about building garden walls. 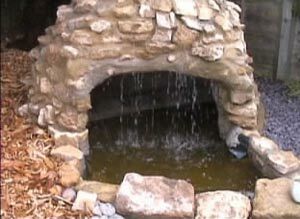 We wanted the construction of the cave to include the pipe from the pond pump within it, so a waterfall effect could be created over the opening to the cave. You can just see the pipe sticking out at the top. 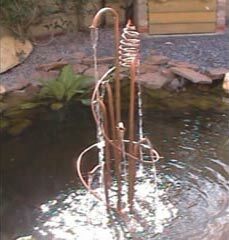 The main function of the pond pump is to circulate the water from the main pond at the bottom of the garden to the top (holding) pond at the top, where it is allowed to run down the stream and back into the main pond. One main pipe runs from the main pond to the holding pond, and there is a spur off this pipe to feed the waterfall feature over the cave. 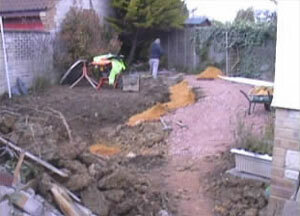 We used special reinforced pond pipe for the purpose, and buried it in the ground so it was not visible. Each feature is fitted with isolation valves so it can be used independently from the others. 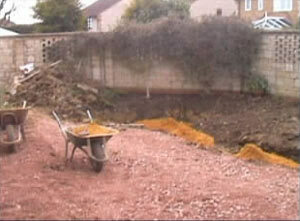 The isolation valves for the holding pond and the waterfall were fitted behind the cave so they are not visible either. The pump also circulates the water to a fountain in the main pond. Water is continually recycled around the whole system when the pump is on, and as mentioned each individual part of the water feature is controlled by a series of isolation valves. In addition there is a small separate pump which sends water through a UV pond filter and back into the main pond, and this is left on all the time, except for the coldest winter months if the pond freezers. 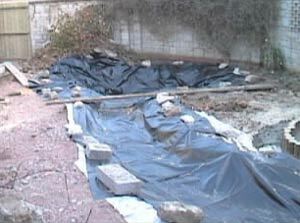 Now to line the pond and stream: We used thick heavy-duty pond liner laid on top of pond liner underlay. Again do not skimp on the liner, especially if you have children. It needs to be really heavy duty, because they will not be able to resist a little paddle, and even with the sand and liner protecting it the thinner the liner the more likely it is to get damaged or split. 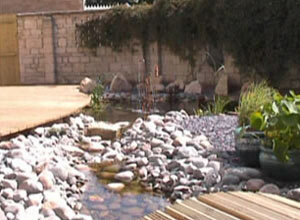 We created the holding pond especially so the children can paddle. Together with the cave, there is much fun to be had in there. Before we lined it, we built a paving stone bench inside and applied another coat of render, which we smoothed with a sponge. This is now being covered with a beautiful array of "cave paintings"! 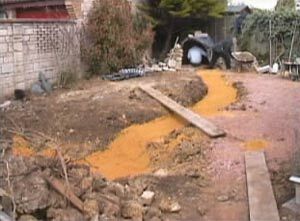 We laid the liner for the ponds and the stream with a foot (300mm) or so overlap which will later be covered to hide it. Having some extra lining ensures that when the water is in, weighing down the liner, that it is still a little higher than the level of the water to prevent water logging the garden adjacent to the water features. 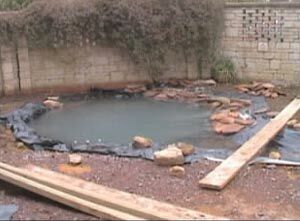 When the liner was in we had to fill the pond for the first time. This allowed the liner to take the shape of the hole and settle to its lowest level. Make sure you do this before you do any work on hiding the edges of the liner. Were you to set any edge stones first, when you then fill the pond the weight of the water will pull on the liner and move everything around the edge. Make sure you allow enough liner for this movement to happen without leaving you with a liner edge only halfway up the pond sides. Filling the pond at this point also gave us the opportunity to test the pump and the pipework we had buried along the back wall of the garden and up over the cave roof. You will no doubt notice that we had constructed a small play area from sawn logs and bark. We placed weed fabric under this first, which we did for all areas of the garden, so that weeds would not spoil the effect once the garden was finished. We marked out the area with site spray – a paint that allows you to see where to place items, but you could use rope or a garden hose to lay out so you can see what looks right. Once we had the boundary we cut the sawn logs into 1 foot (300mm) lengths and set them into a concrete bed around the boundary of the play area. Then we laid the weed fabric, and then we covered the whole area in bark chippings, for a soft landing. 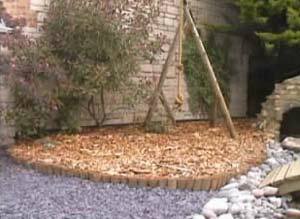 If you wanted to create a woodland bed rather than a play area you could just lay the chippings straight over the topsoil to allow the plants to root into the soil and be protected by the bark mulch. 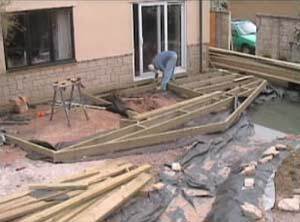 Time to start the decking: Not a complicated process, although the levels need to be spot on. Make sure all the timbers you use are treated to make them water resistant, and that they do not come in contact with the ground where they will sit in water. You will see from the close up, we installed damp-proof membranes and weed fabric under the timbers for the decking frame, and chocked them up on a small wedge, wherever possible, to help protect the timber from moisture as much as possible. The decking slats are simply screwed to the frame (we did not nail these because we have cables running underneath to provide power to the pumps and lights. Screwing them down enables us to get at the junction boxes should we need to, without destroying the deck). 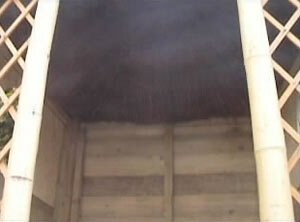 The decking overhangs the frame by about 12-15 inches (200-300mm). 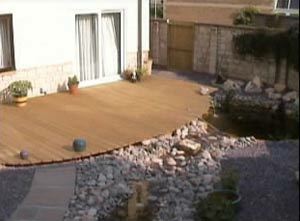 See how we build the deck in our Decking Project. 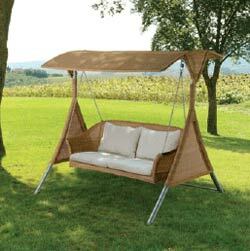 Find garden furniture to suit your needs, do you want to lay out in the sun, dine in style or swing in the shade? This garden furniture is available from Celebration Furniture and can be left outside all year and washed down to maintain it. Just click on the images for more information or to order it online. Being able to leave your garden furniture outside all year is a great bonus, if you do not have sufficient storage space to store it in the winter. 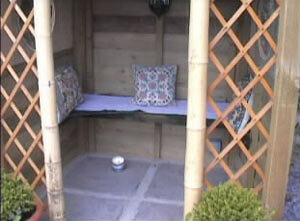 Now it is time to show you how we put the summer house up. It is a simple four post construction, concreted into the ground. 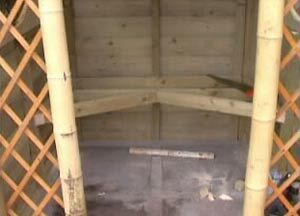 The hipped roof was cut to take plain tiles with bonnet hips for an attractive, almost oriental roof line, to offset the bamboo doorway. The trellis was an afterthought, that we think works really well and provides structure to the front of the Summer house. The walls are constructed out of shiplap. The circular windows were supported by an internal frame cut from marine ply and covered with clear acrylic ‘glazing’ which is safer than glass. We also fitted a light which is controlled from a panel inside the house, plus an external electrical socket. Sorry it is not the best picture in the world of these two things! We have to admit this is not the clearest picture in the world either, but you may be able to see that we "thatched" the ceiling with something called Heather Roll or Heather Screen. You will see some more on the "pump house" later. 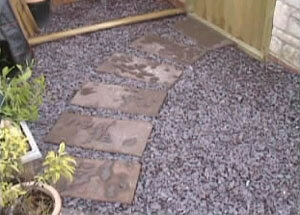 The floor was paved at the same time and with the same paving slabs that make up the garden path. This curved path then leads the eye along it and straight into the Summer House, making a natural focal point for the garden. Distracting the eye from the long expanse of fence and leading it towards the water features and the cave. The pump house went up next. This contains a UV standard filter for the pond, which has it’s own separate small pump. 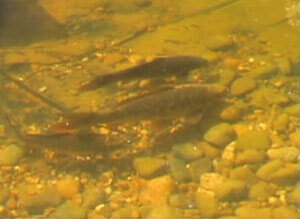 The water is pumped from the pond, through the filters and straight back into the pond. The pump house has a concrete base and stone walls which match the existing garden wall; the front lifts off to expose the filter unit. The roof was made from marine ply, covered in roofing felt to make it waterproof and then ‘thatched’ in the same Heather Screen we used for the inside of the summer house roof, to soften the effect. 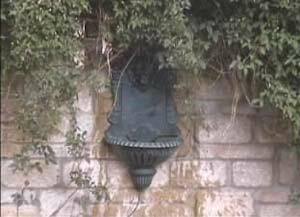 Lion Head Fountain Mounted on the Wall – We nicknamed him Dribble! 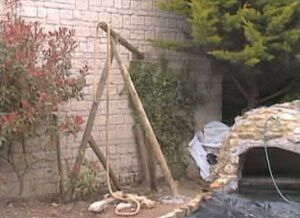 The main pump takes water from the pond, through a 32mm pipe, along the garden wall and to the cave. It splits here, on a valve, to feed directly into the holding pond and, with a turn of the valve, over the cave to form the water fall. The "pump house" also contains the switched connection for "Dribble" our Lion-head wall fountain. Having an external filter gives you a much better filter and makes to process of cleaning much simpler. All the electrics for the pumps are special pond pump electrics and cables to make sure they are safe to be used around water. All the electrics are operated from a small panel inside the sitting room, and we recommend that if you have lighting and water features that you do the same, so that it is really easy to turn on and off any of the effects you want to see in your garden. 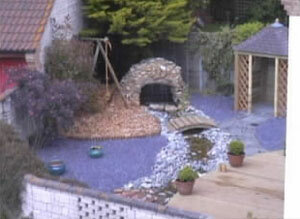 We placed the bridge to the play area to keep the little ones out of the stream….. Some hope! This is a delicate curve which gives the structure strength and looks very pretty. It also allows you to play Pooh Sticks! We used paths to define walkways, and crushed slate was introduced as a ground covering (with weed control fabric beneath). The edges of the ponds were covered with stone, the stream bed was lined with gravel and pebbles were placed along the stream bed to define the edges and to cover the edges of the liner. Make sure the stream bed looks good when the stream is empty, that way you do not have to run the pump for the steam all the time, but only when you are around to appreciate the sight and sound of the running water. The overall ground effect was now complete…Then a brilliant idea by our garden designer! A simple curve of reinforcing steel fixed to the garden wall, in a curve to allow the plants either side to “creep” over in an arch and form a very attractive screen from the upper floor windows of the neighbours’ house. The combined efforts of a clematis and a Passion Flower Vine made the leap in a year or so. We thought we would just finish off with a few pictures of the Water Features and the Fish that live in them and you can see we have started to plant up the pond with marginal plants and lilies. 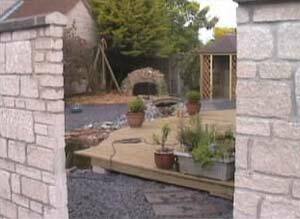 You can see the edging stones are arranged to give a natural edge to the pond, and the deck overlaps the pond so you can easily see the fish. 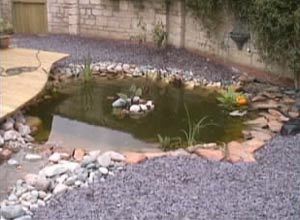 Don’t forget if you can see the fish so can predators, so make sure you give the pond fish somewhere to hide, the overhanging deck help with this and you can use planting. One side of the pond has a very shallow slope to encourage wildlife to use it, and to prevent hedgehogs and other small creatures getting stuck in the deep water. They are great swimmers but they need a slope to get out! This was the end of the Hard Landscaping bit, you can see there were some existing plants that were left in place but more planting was added later to soften the effect and blur the boundaries of the garden. The planting choices were all part of the original garden design, including the choices of which plants to remove and which to leave in place. Let’s Not Forget the Fountain! 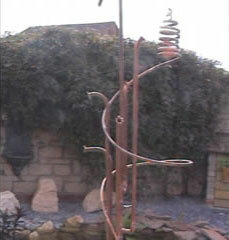 We decided to add a handmade copper water feature into the middle of the pond. 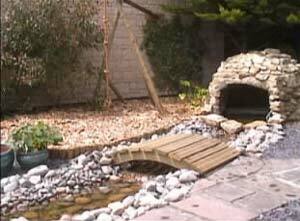 Fountains and waterfalls aerate the water which is good for all freshwater fish. Fountains and waterfalls also give a lovely sound of running water which can help to mask other noises such as traffic noises. All the different water features can be turned on and off independently of each other to give total control of the effects of the water in the garden. 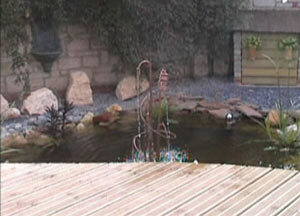 The movement of the water bounces light around the garden too. Speaking of Light it is a great idea to get light into the garden to alter the mood of the space and to extend the time you can use the Garden in the evening. We took the greatest care in picking the lights and installing the outside electrics to make sure they were perfectly safe. 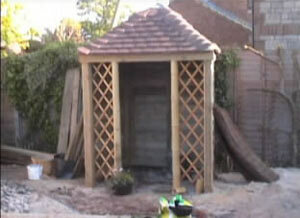 You can see a video about installing garden electrics and garden lights in the video at the bottom of the page. Hopefully we have put you on the right ‘path’ (pardon the pun) and given you a great deal of inspiration and some useful garden design ideas and garden design pictures to get started on your own Garden. As mentioned earlier in this project guide, if you would like any help and advice on how you can best treat timber and woodwork in your garden including garden furniture to ensure that it lasts then give Property Repair Systems a call. They have many years expertise in the treatment and repair of timber and will advise you on best practice and also the best products to use. Give them a call on 01626 336180 – all advice is free of charge and with no obligations. You can also look in our Garden Section for more Garden Projects to inspire you. Why not go to our video sections on composting at home and how to do it, garden basics for gardening beginners , ponds and waterfeature ideas for your garden and garden design to watch various films relating to gardening.